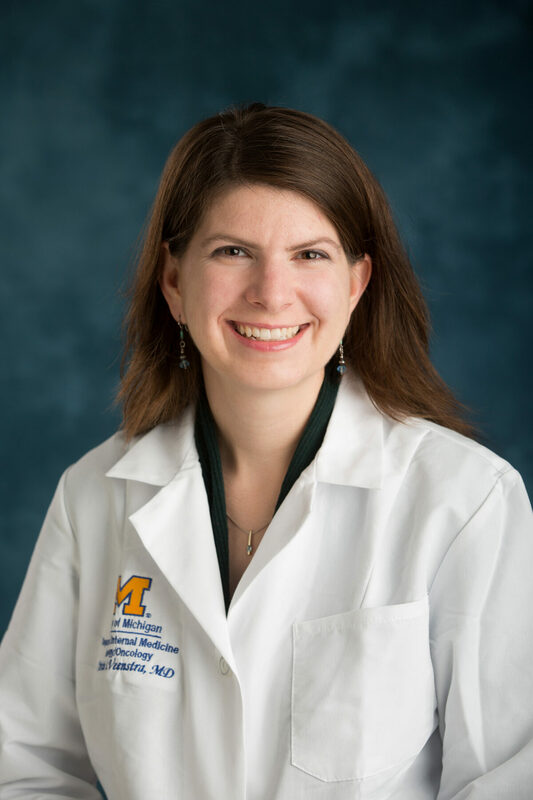 Christine Veenstra is an Assistant Professor of Internal Medicine at the University of Michigan. She received her medical degree from Wayne State University in 2005, completed internal medicine residency and chief residency at University of Michigan in 2009, and then completed fellowship in medical oncology at the University of Pennsylvania in 2012. Dr. Veenstra’s research interests include identification of factors that influence the delivery of cost-efficient, high-quality cancer care. Specifically, her research involves the study of hospital and patient factors that contribute to high-value, guideline-concordant medical care. Dr. Veenstra received a K07 career development award from the National Institutes of Health entitled “Partner Engagement and Receipt of Surveillance in Colorectal Cancer Survivors” in July 2016. The goal of this project is to gather data to develop and implement interventions to improve the receipt of high-quality colorectal cancer survivorship care.